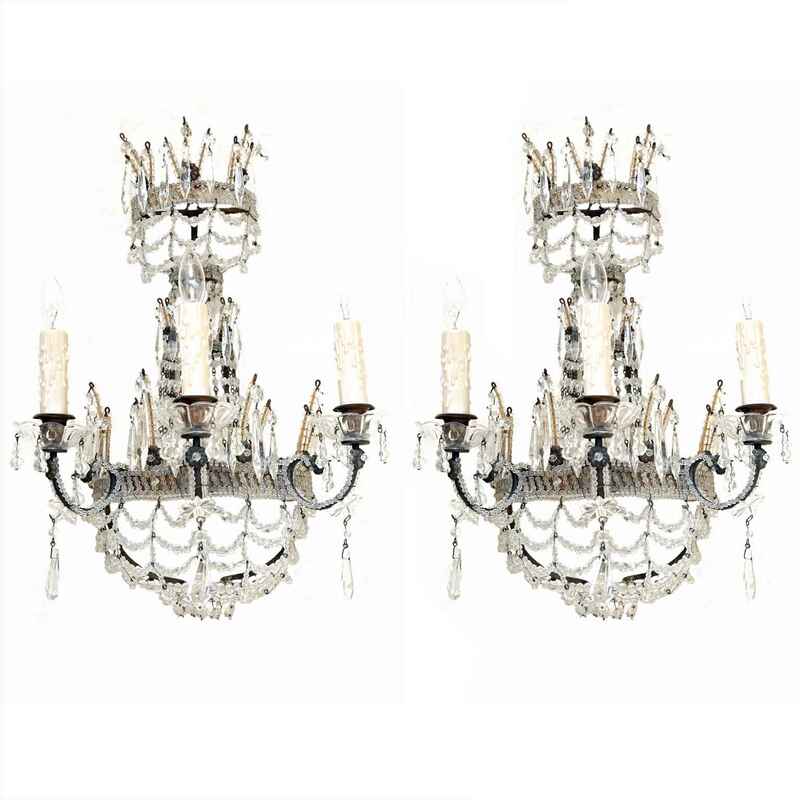 Pair of bead encrusted sconces, in the Italian Maria Theresa style, having a frame of patinated bronze, each with a crown adorned with spires and crystals, surmounting cascades of crystal strings, to a semicircular ring, decorated with similar macaroni-crystal spires, extending three S-scroll candlearms, ending in scalloped bobeches, over a reticulated basket bottom, the entire fixture adorned by faceted crystal drops. Pair of bead encrusted sconces, in the Italian Maria Theresa style, having a frame of patinated bronze, each with a crown adorned with spires and crystals, surmounting cascades of crystal strings, to a semicircular ring, decorated with similar macaroni-crystal spires, extending three S-scroll candlearms, ending in scalloped bobeches, over a reticulated basket bottom, the entire fixture adorned by faceted crystal drops. CONDITION: Excellent. Wear consistent with age and use.